First I would like to say how honored I am to be chosen as a Featured Stamper on this blog and to be in the company of so many talented crafters. Thank you very much! I have been stamping for 7 or 8 years now and I am lucky enough to have a spare bedroom that is dedicated to my hobby (or addiction, as my husband lovingly calls it). It’s only a 10’ x 11’ room but I try to keep it well organized and straightened up as much as possible. It does get a quite messy when I am in the process of preparing for classes, though, and that makes me nuts. Neat freak? Me? Nah. Well, maybe. Favorite stamp products - I love my Cuttlebug and Sizzix embossing folders and dies, and I would not do without the Spellbinders Nestabilities and dies. Copic markers - I adore them!!! I never liked coloring images until I found these markers, now I look for images that need to be colored. 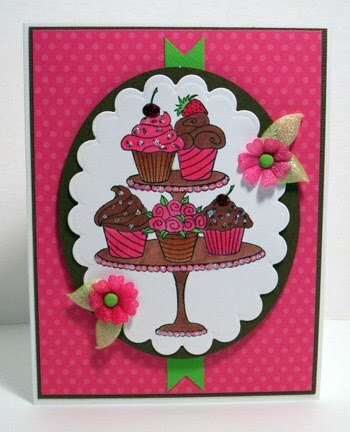 I love to use ribbon, buttons, and gems on cards, too. I like the look of glitter but hate the mess, so I mostly use Stickles (but not on the OWH cards). My favorite stamp company is Hero Arts. I love their stamps, papers, and inks. Their images are awesome and they manage to keep their prices reasonable while still producing high quality products. I am also very fond of Stampendous, Impression Obsession, and PaperTrey Ink stamps, just to name a few. I can’t say that I have a favorite technique because I like to try out different ones all the time. I do sponge the edges of images a lot but I’m not sure that is considered a technique. Mostly I prefer cheerful colors for my cards - pastels and jewel tones more than neutrals or darks, but right now I seem to be on a Kraft card stock kick. It just makes the other colors on the card pop! The colors of Autumn are my favorites and I look forward to that season every year. Burnt orange, golden yellow, sage green and vibrant burgundy….lovely! I can’t really remember how I first heard of Operation Write Home, which was Cards for Heroes when I first found it. I suspect it was a link on someone’s blog, that’s how I find most things these days. I am so glad I found you, though. It is such a wonderful thing to do for our troops and I am happy to be able to contribute in some small way. My husband is a Vietnam veteran and is very involved with Richard’s Coffee Shop, a veteran’s coffee shop in Mooresville, NC. He serves on the board of the non-profit which owns the coffee shop and spends many hours there talking with other veterans. Whether it is a WWII veteran or someone just back from Iraq or Afghanistan, it is the highlight of his day. It’s just another grass roots effort to show appreciation and gratitude to those who serve our country. That daisy card is stunning! Hello Jackie, so nice to meet you and learn a little bit about you. Your cards are simply amazing, and so so pretty! 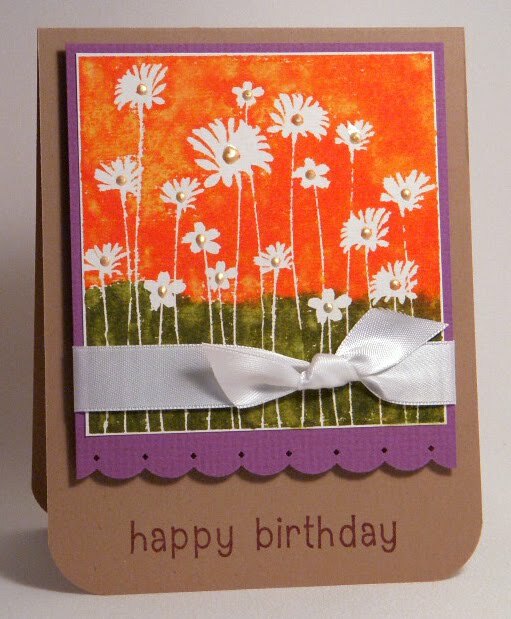 I'd love to learn to create a flower like the one on your pretty birthday card! Hi Jackie! Wow - I second the request for the tutorial on that birthday flower card! It's so pretty! Thanks for sharing your story. I love Featured cardmaker days. :) All of your cards are so colorful and pretty! Wow Jackie, your cards are beautiful! Do you have a blog so we can follow you? Thanks for sharing your cards and story with us! They are all gorgeous and I am not surprised to find you featured, nor that you do this for our troops! Your cards are always terrific, lady! These cards are ALL beautiful! Thanks for sharing your talents, tastes and thoughts with the rest of us. Fabulous cards! I Love bright, cheerful cards and your's are definitely cheery. Beautifully done!! Jackie, you rock! 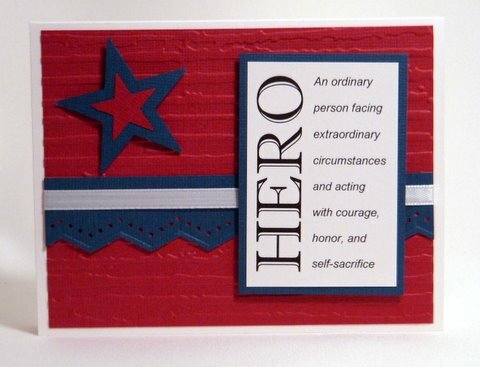 Thanks for making such classy cards for our heroes! Jackie, you are so talented. I bookmarked your blog and I'm going to follow you. Well I'm going to copy each one of those cards (my highest forms of a compliment). Just beautiful. thanks for sharing. Nice to meet you! Your cards are gorgeous and I LOVE the colors. The happy birthday card, was that a resist technique? Pretty neat! Your cards are perfect! Thanks, for sharing. 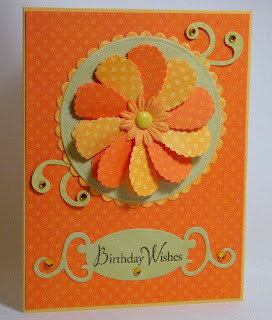 Love all the cards, but am very taken with the orange flower one. Are they hearts that you folded in half? Thank you all for your lovely comments, you make me blush! My blog address is Just Stamp It! and I'd love it if you all visited once in a while. To answer your questions - the flower on the birthday card is made from folded hearts - feel free to email me for more information. You are a neighbor (live in Mint Hill NC); all your cards are lovely but the smile card is my favorite! Jackie, congrats on being featured, You did a great job on all your cards! Jackie - Your cards are ALL fantastic and I think you are very talented!